Gary Orren identifies authority/credibility as the most important in the ethos (characteristics of messenger) cluster of persuasion principles, and authority is one of Robert Cialdini’s 6 principles of persuasion science. Cialdini notes that people will tend to obey authority figures, even if they are asked to perform objectionable acts and cites incidents such as the Milgram experiments in the early 1960s and the My Lai massacre. Cialdini notes how this principle can be used in an ethical manner by finding ways to inform the audience in advance of the presenter’s credibility and expertise, including by having your credentials endorsed by another person. Gary Orren, PowerPoint presentation in 2005 to the Mortgage Bankers Association, Persuasion: The Science and Art of Effective Communication, accessed 17 January 2016 and “Cialdini’s Principles of Persuasion.” Robert Cialdini and Steve Martin, Secrets from the Science of Persuasion, published on YouTube 26 November 2012, at https://www.youtube.com/watch?v=cFdCzN7RYbw, accessed 17 January 2016. 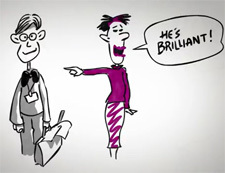 Image: Robert Cialdini and Steve Martin, Secrets from the Science of Persuasion, published on YouTube 26 November 2012, at https://www.youtube.com/watch?v=cFdCzN7RYbw, accessed 17 January 2016.